Now through March 31, 2008, MidwayUSA has Eley 17 Mach 2 ammo on sale for just $3.99 per box (item 134258). This ammo, based on a 22 Stinger case necked down to 17 caliber, shoots a 17gr jacketed V-Max bullet at about 2050 fps. We’ve shot all the various brands of 17 Mach 2 ammo in a Hall-actioned BR rifle, and the Eley is as good as anything out there. What you’ll typically get with a 5-shot group in a good rifle is 3 or 4 shots in a tight cluster and then one out. This is caused by a lot of factors (run-out, crimp problems, OAL variations etc. ), and is true of all the 17 Mach 2 brands you try. Still, the round is fun to shoot and the 17 Mach 2 will deliver sub-MOA groups at 100 yards even with the “flyers”. When you consider that most brands of the 2500 fps 17 HMR ammo now cost about $12.00 a box, the Eley 17 Mach 2 is an excellent value. The Mach 2 delivers the same 17gr V-Max bullet as the 17 HMR, but the Mach 2 just runs a little slower — 2050 fps vs. 2500 for the 17 HMR. For many shooters, it makes sense to use the 17 Mach 2 rather than a 17 HMR. With the sale-priced Eley just $3.99 a box, you can buy 150 rounds of 17 Mach 2 for the price of 50 rounds of 17 HMR. Share the post "Eley 17 Mach 2 on Sale at MidwayUSA"
The folks at Target.workz.us have created a nice do-it-yourself project. To create a sturdy, self-supporting target frame, all you need are some 2x4s, 1x2x48 furring strips, plus fasteners. The target holder, which supports an 18×24 inch cardboard target backer, separates from the base for easy transport. Note: There is no cross-piece shown in the plan, but we do recommend putting wood crosspieces at the top of the target stand and about 18″ up from the bottom. This will make the frame more rigid, and will allow the frame to work even if the cardboard is badly “shot up”. Use a T-square to set the crosspieces before attaching them with screws. 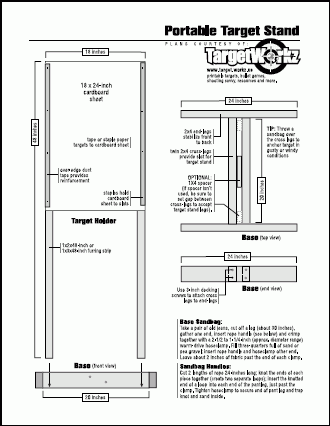 If you like these plans, you also find a variety of fun shooting targets, plus shooting tips, at Target.workz.us. Share the post "FREE Plans for 48" Target Stand"
To comment on a post, click Post Title or "Comment" Link. The Bulletin title serves as the "Home" button. To get ALL posts, click the Bulletin Title or Bulletin Button at top of page. ALL Bulletin content is copyrighted, © 2018 AccurateShooter.com. You may not reproduce original text or photos without advanced permission in writing.